I first had this salad in June of this past year. We were leaving Maryland and our friends had invited us over for a goodbye luncheon. Natasha served this salad with a few others. THIS SALAD is amazing! I have tweaked it a bit from her original recipe, but let me tell ya, I make this salad for every guest that comes to our home....AND? They love it. I think love may not be a strong enough word. 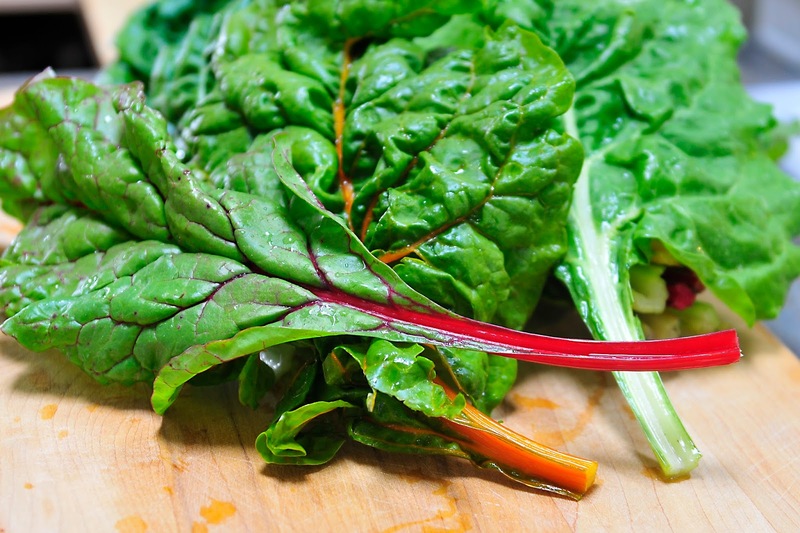 People are shocked to be eating Swiss Chard. 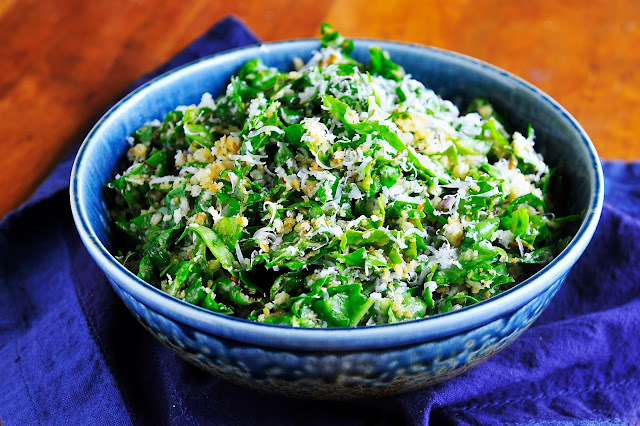 Most of them have never had Swiss Chard and instantly fall in love with the texture and flavor. It's hardier than a regular green salad. I believe what makes this salad so beloved is its simplicity. 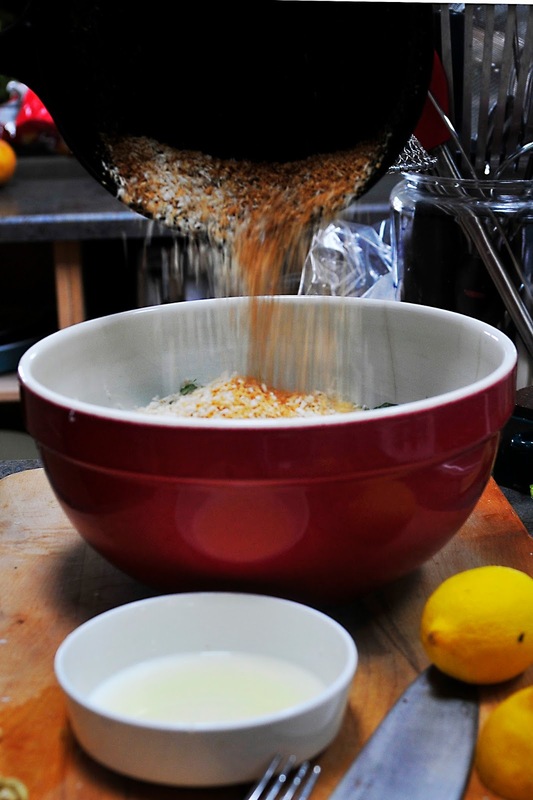 The combination of lemon, bread crumbs (Panko in the picture above) and olive oil riles up their taste buds. The balanced dressing makes you notice how perfect a salad can with a few ingredients. Everything we make doesn't have to be fancy to be good. I find Swiss Chard year round where I live. This particle variety is called Rainbow Swiss Chard. The stems are different colors. I personally don't include the stems in the salad. I use a small pairing knife and trim the stem out of each leaf. I find the stem to be tough. I toast the Panko crumbs in a dry cast iron skillet over medium high heat. They turn a nice golden brown. I have also used croutons that I make up ahead of time from old bread. I crush them in a bag and toast them like the Panko crumbs. If you are gluten free either omit the bread crumbs all together or use a gluten free variety. 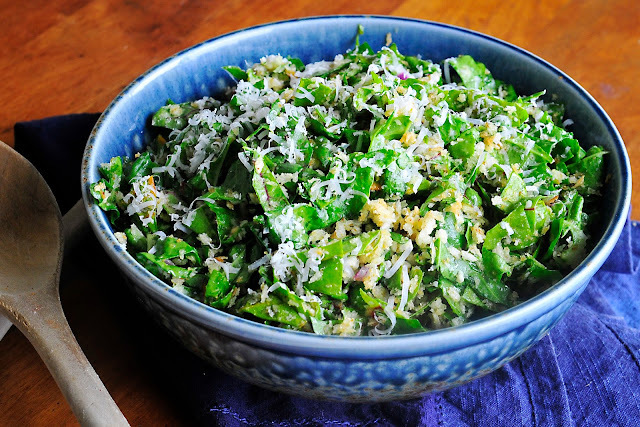 If you use cheese, then I would recommend a nice strong Parmesan to finish this salad. I also have friends that add bacon. We don't add bacon because we don't eat it but if you do....then go for it. This salad stores in the refrigerator well. I have heated it up the next day for a few seconds in the microwave with excellent results. The bread crumbs/Panko crumbs get a little soggy but this does not bother me. I live across the street from a beautiful bay along the Oregon Coast. We often see bald eagles flying and nesting in the area. On the day that I shot the pictures for this piece I turned and looked out the window to see a bald eagle fishing right in front of me. I had no time to get a stronger lens so I used what I had. I captured this image below. 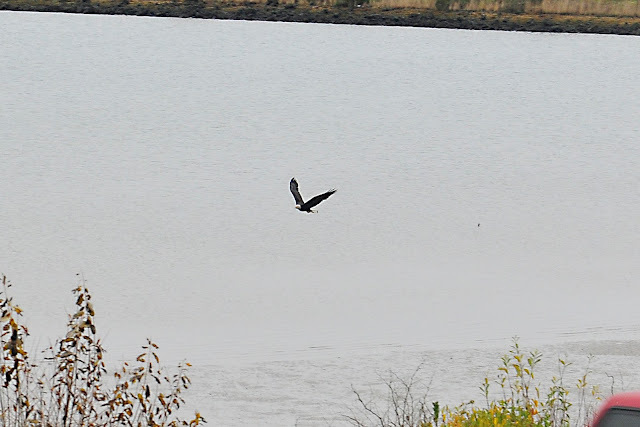 I tell you, the excitement and thrill that pulsed through my veins to watch this spectacular bird in its natural habit and so close to my house...was incredible. 1. Slice the swiss chard leaves into bite size pieces. In a bowl add all of the ingredients and toss. 2. Taste the salad and adjust to your taste buds. 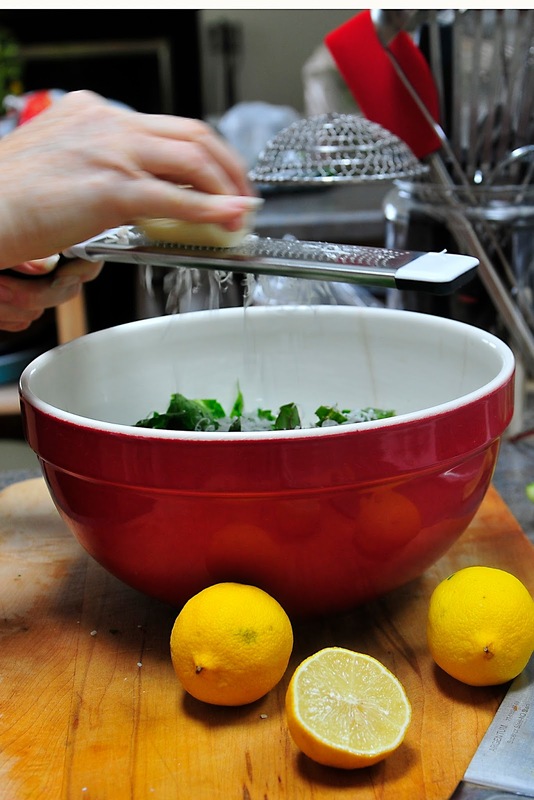 We like ours tart so I add more lemon usually.